I’ve mostly focused on the waves and their effects, on the sky, the sand, the birds. People leave their marks in many ways, too. Footprints, bicycle tracks, lifeguard vehicle tracks, marks from dragged sticks, sand castles, abandoned sand toys…and lovely small monuments like this one. Simple and elegant. The dramatic lighting just before sunset magnifies the edges, the textures, the colors. We were with our friend and noticing the many colors of the pebbles, the smoothed shapes, the varied sizes, the inclusions, the spots, the ones half-buried in the sand, marveling at their age, their shininess when wet, their softer-looking matte surfaces when dry. A pile of stones. 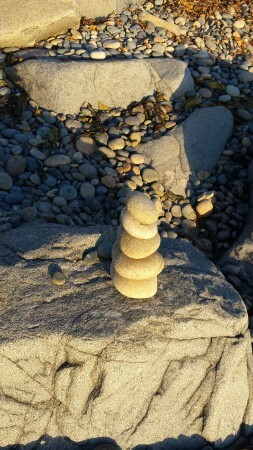 A small pile of stones. A small mark, I was here.